"Sereno Payne was a local lawyer and former city clerk. He served in Congress for all but two years between 1882 and 1914. The Republican lawmaker was also chairman of the House Ways and Means Committee and later the majority leader. He died in Washington, DC in 1914." Sereno Payne was born in Hamilton, NY June 26, 1843, the son of the late William Wallace Payne, a farmer who was elected to the New York Legislature in 1858 and again in 1859. Sereno graduated from the University of Rochester in 1864, was admitted to the bar in 1866, and has since practiced law in Auburn with the firm Payne, VanSickle, and Payne. Mr. Payne was united in marriage in 1873 to Getrude Knapp of Auburn and has one son, William K Payne, who is the junior member of his law firm. The house of Sereno Payne still stands at the corner of Orchard and James Streets. 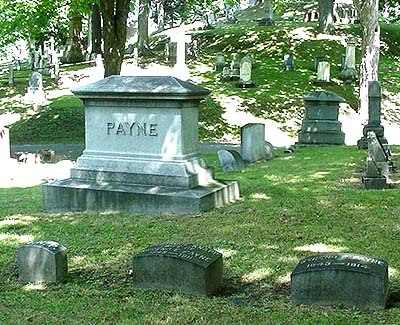 The Payne family plot in the Ridgeland Section of Fort Hill Cemetery. The headstone for Sereno Payne is in the lower right corner of the photo. William K Payne (1874-1965) is also buried in the lot. He is next to Frances Nye Payne (1883-1946), one of George and Mollie Nye's six daughters.